How is the Sequester Affecting US Army Modernisation Plans? Members of Congress and staffers got a first-hand chance to examine weapons and have one-on-one discussions with Soldiers during Army Day, April 25, 2013. 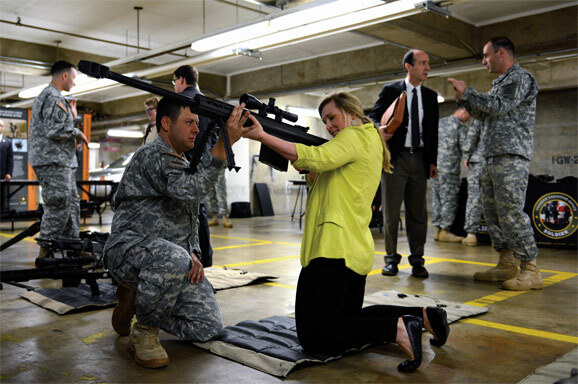 Here, congressional staffer Sarah Rogers handles a weapon as Major Kralyn Thomas, with the Army’s Program Executive Office Soldier, explains its capabilities. Photo Credit ©: Lisa Ferdinando, ARNEWS. However, extending modernisation programs really is only a Band-Aid type fix, that in the long run will increase the costs of these programs, since pushing them back will cause the Army to incur penalties in renegotiating contracts with key industry partners. That was the scenario Barclay painted back in February in the early days of the Sequester. Flash forward a few months to April, and let’s take another look. April 25th, 2013 to be exact, or “Army Day” as it is known on Capitol Hill. Army Day, gives the US Army its best opportunity to showcase its latest technology and medical advances to members of Congress, to highlight the importance of funding for modernisation, and R&D efforts to “better equip, protect and care for soldiers.” It’s like a military trade show on steroids where members of congress get to have a literal “Field Day,” handling weapons, looking through night vision goggles and thermal imaging displays, trying on body armor, and really getting a hands-on experience with the latest in warfighter tech. “A lot of the issues going on right now are with sequestration and funding, and it’s easy to just see that as numbers on paper,” said Congressional staffer, John Witherspoon, who was among the hundreds of lawmakers who got to speak with soldiers and handle their gear. “But once you get out here you can see what that money is going toward, and why it’s so important. It’s always a great opportunity when you are able to do that,” Witherspoon added. Lt. Col. Ed Ash, a budget liaison officer, said Army Day presents a great opportunity to demonstrate for Congress the importance of soldier modernisation. outlined for visiting lawmakers the broad spectrum of advanced military medicine, not only improvements in treating battlefield trauma, but care for brain injuries and psychological health, to advances in prosthetic limbs that have allowed soldiers to remain on active duty, and even return to combat. Hack was also sure to point out to members of congress the “tactical to practical” aspects of combat medicine. He said that advances from the battle field always find their ways into civilian ERs. This was most recently evidenced with the excellent trauma care provided to victims of the Boston Marathon bombings.